GET BODIED — BRUXAS. BRUXAS. In our recent exhibition, Get Bodied, artists entered the space each day to conduct workshops, perform, and engage the academic community at Penn State's Zoller gallery. As the exhibition progressed, a concurrent collection of new material occurred and was projected, or installed in the space. 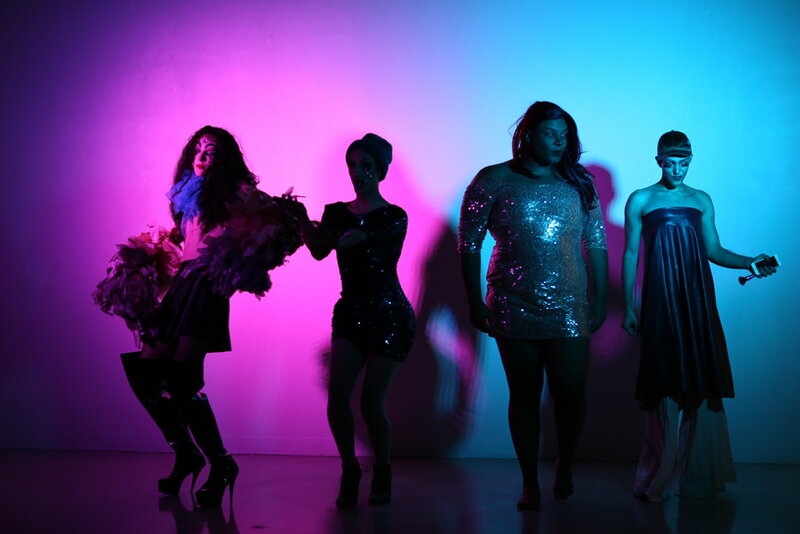 Get Bodied featured varied productions ranging from drag performances, slam poetry, and hip-hop to name a few. All visitors became a part of the final performance through the documentation of their engagement. Central to our collaborations is the disruption of socially embedded power structures, visual matter, and cultural normativity. Our evolving collections of media, performance, and installation challenge stationary ideals of cultural capital. Our merged media intervention embodies performance, allyship, and creative pedagogy for an ongoing assemblage of fluid otherness. Take A Knee Fox News, 2017, Performance and Digital Installation. -Referencing contemporary events, we speak for ourselves with hopes to widen the fine art platform. Taken During Closing Reception. Political Portraits, 2017, Performance of dialogue and empathy. -Lead by artist Xalli Zuniga, Political Portraits is composed of a series an interactive works where collaborators are invited to engage in political conversation on the subject of individual vulnerability in the face of identity politics. Taken during the first day of a two week long exhibition. This event included the screening of Daniel Ulacia's "Saludos desde el Mercado de la Merced" (2015). Flat Track Derby , 2017, Interactive Performance. 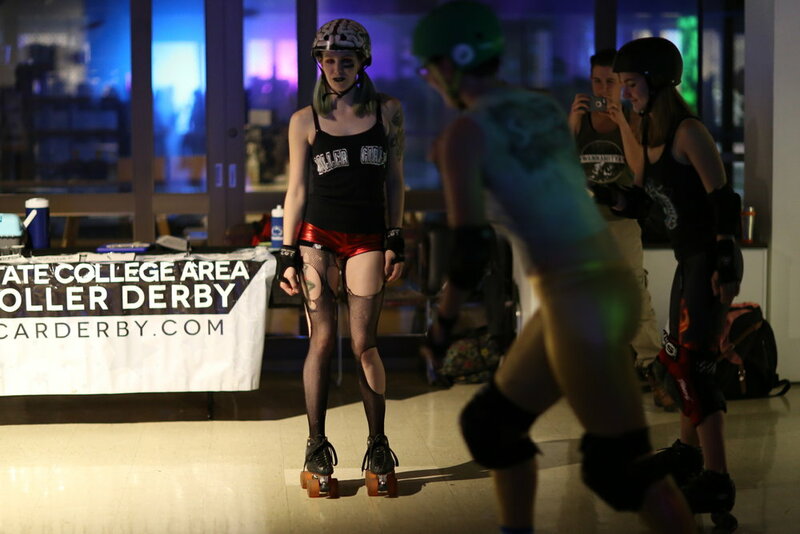 -Zombabe challenging the camera at the closing reception of Get Bodied, in Edwin W. Zoller Gallery at Penn State. Blaq N' Nappy For The Kids , 2017, Hip Hop Performance. -Philadelphia Rapper, Marcus Pearson greeting the closing reception collaborators. Tazompantli con gua c, 2017, Installation of collected paper and twine. 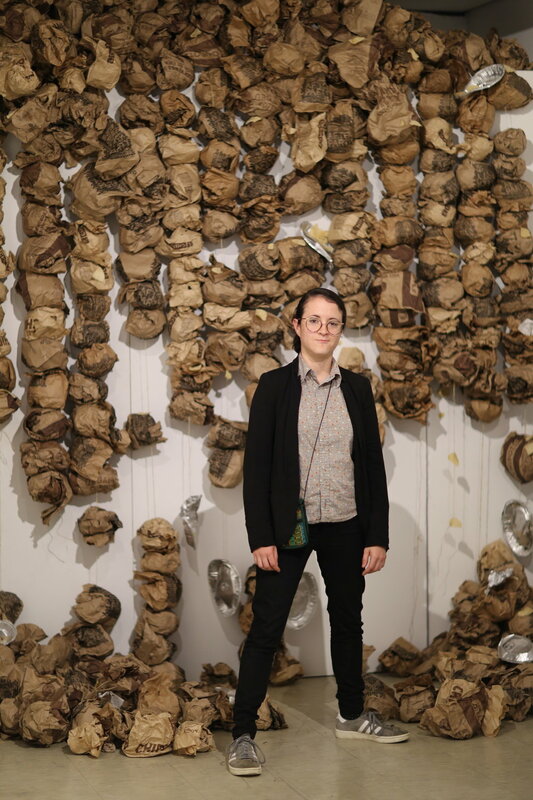 -Mexican artist Xalli Zuniga posing in front of her installation made of discarded food bags from Chipotle and Taco Bell. Yes, I rap...Yes, I know I’m white... , 2017, Performance. -Michael Morrisey, unabashedly accountable for one half of Blaq N’ Nappy holds the beat while lyricist Marcus Pearson lays down the lines. Taken During Closing Reception. Black Girl Magic , 2 017, Performance. -Alonya Chest gives us a intersecting snippet of hypnotic vibes throughout her display of drag and resistance. Taken During Closing Reception. Norristown Swag , 2017, Instillation of bamboo torches, cotton rope, and beads. 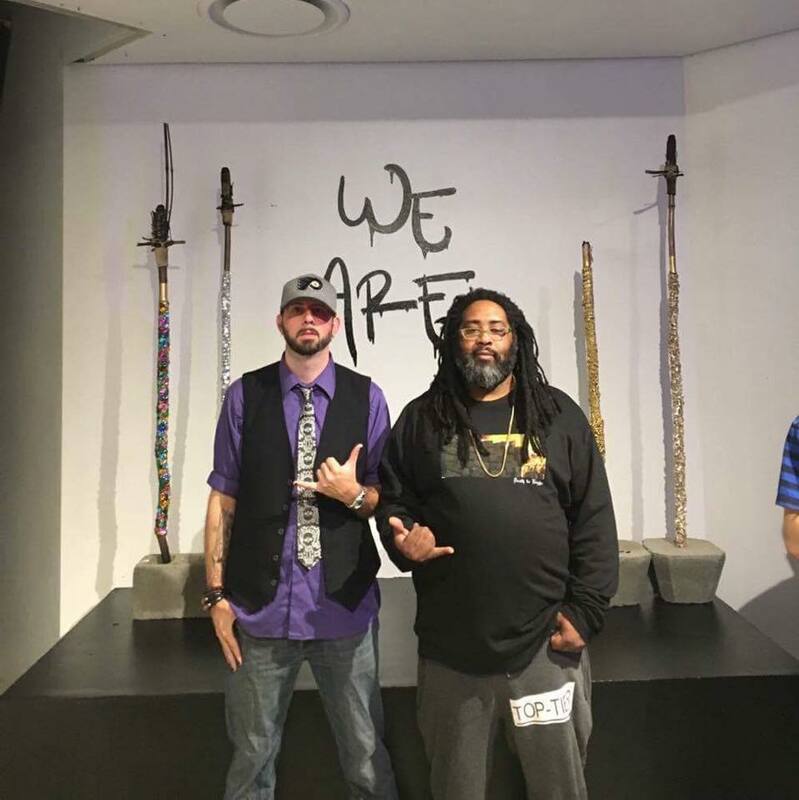 -The rap duo Blaq N’ Nappy posing in front of artist, Ciara Newton’s installation titled White People N’ Tiki Torches . Generational Whiteness , 2017, Instillation of white linen and starch. -1 of 4 works grappling with representational images of whiteness by Philadelphia born artist, Kristina Davis. Art Education , 2017, Charcoal on newsprint. -During the final musical performance at the closing exhibition, Get Bodied, young collaborators design a fresh album cover. 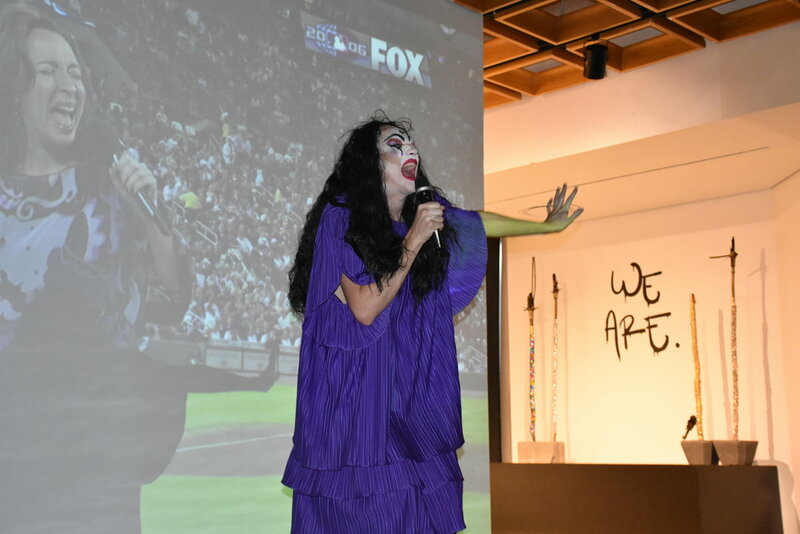 José Queervo and the Valley Hags , 2017, Drag Performance. -“. . . and when we speak we are afraid our words will not be heard nor welcomed but when we are silent we are still afraid. So it is better to speak remembering we were never meant to survive” (Lorde. 1995). The Banshee , 2017, Interactive Performance. 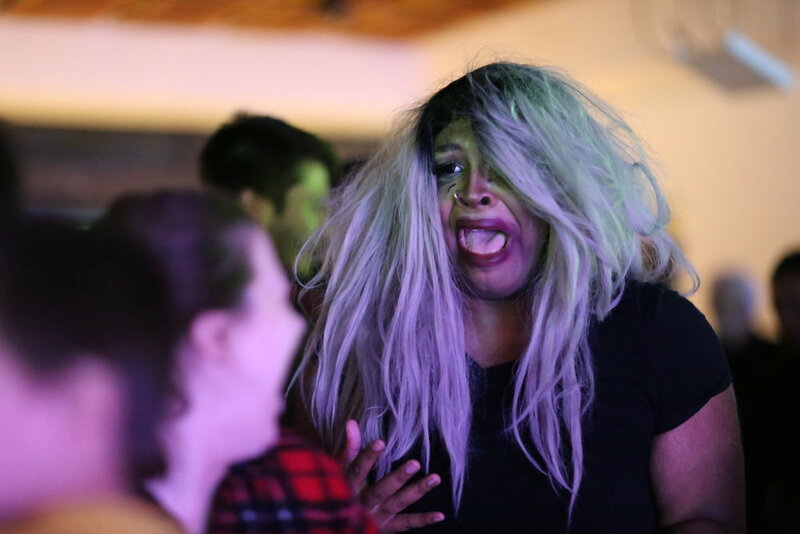 -Drag Queen Alonya Chest mingling with collaborators while performing to pop icon, Rihanna's Hysteria. Taken During Closing Reception. Big Booty Djoodi, 2017, Digital Installation and Performance. -The compelling stage presence of the wunderkind Absinthe during her performance of Röyksopp’s, Running to the Sea. Taken During Closing Reception. Let's Feel It All Over People (Wonder, 1976), 2017, Improvisational Performance. -José Queervo taking a break with Sir Duke. Intermission of closing reception. What Chu Got?! , 2017, Slam Poetry. -The award winning slam poetry group from Pennsylvania State University, W.O.R.D.S. showing love and solidarity post performance. Taken During Closing Reception. مرحبا ( Hello), 2017, Performance. -The dark goddess of drag, Pearl of Arabia lingering in the shadows during her performance of Adele's, Hello . Taken During Closing Reception. Single Ladies , 2017, Dance. 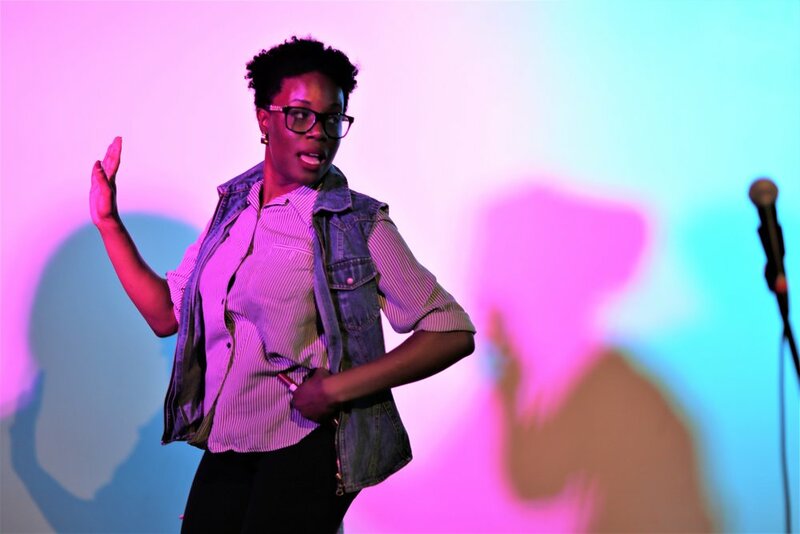 -Poet Nicole Williams from Mississippi, flawlessly performs Beyoncé’s single ladies choreography. Taken During Closing Reception. Cosmic Cosmetics , 2017, Performance. -With pom poms of fury Queen and Host, José Queervo vogues her way into our hearts. Taken During Closing Reception. Leave No Wig Behind , 2017, Instillation of monofilament. 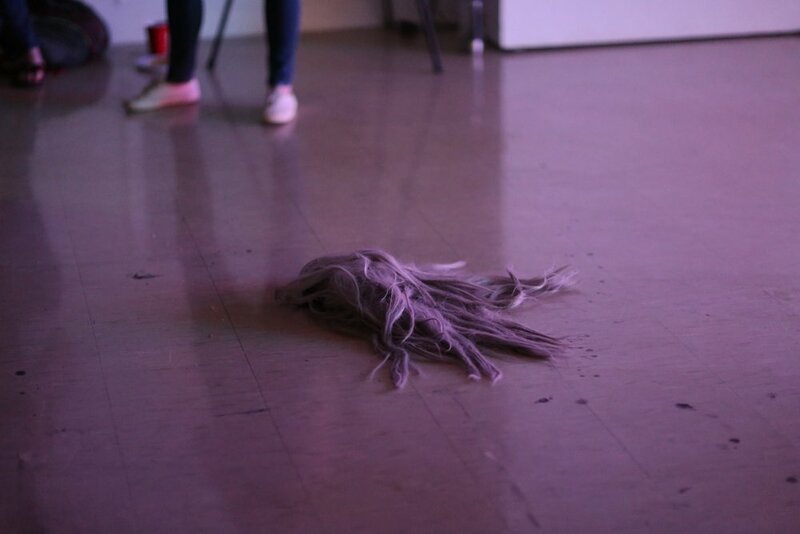 -Post performance, a fallen wig becomes a works of its own. Taken During Closing Reception. Round of Applause, 2017, Performance on gallery walls. -A day before the closing reception, artist Ciara Newton leads a group of collaborators through the steps of wall twerking.